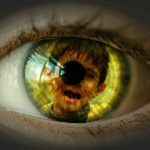 Each year more than 10 million children in the United States endure the trauma of abuse, violence, natural disasters, and other adverse events. Each year veterans of war return to the states struggling to reengage in civilian life. Each day our first responder police and fire personnel face tragedy and trauma beyond what most of us can comprehend, and are expected to turn around and return to the routine of their jobs. 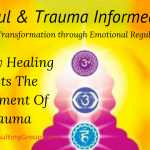 These experiences can give rise to significant social, emotional and behavioral problems that can profoundly disrupt lives and may bring these trauma victims into contact with social service or mental health systems. 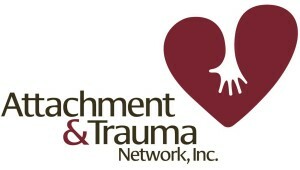 For therapists, first responders, child welfare workers, case managers, and other helping professionals involved in the care of those in crisis, and traumatized people, the essential act of witnessing, and listening to trauma stories may take an emotional toll that compromises professional functioning and diminishes quality of life. 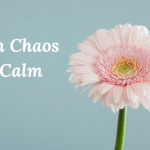 At times, the direct exposure to more significant traumas, up to and including mass shooting events, death or murder scenes, or an out of control client, takes an even greater toll. Individual and supervisory awareness of the impact of this indirect trauma exposure—referred to as secondary traumatic stress (STS)—is a basic part of protecting the health of the worker and ensuring that clients consistently receive the best possible care from those who are committed to helping them. We cannot give away that which is not ours to give. If the worker is stressed, outcomes and quality will suffer. The workers stress will be carried into the client contact. It is incumbent upon those of us who serve others to provide both preventative, skill building support in traumatic stress management, as well as to provide secondary traumatic stress recovery when indicated. 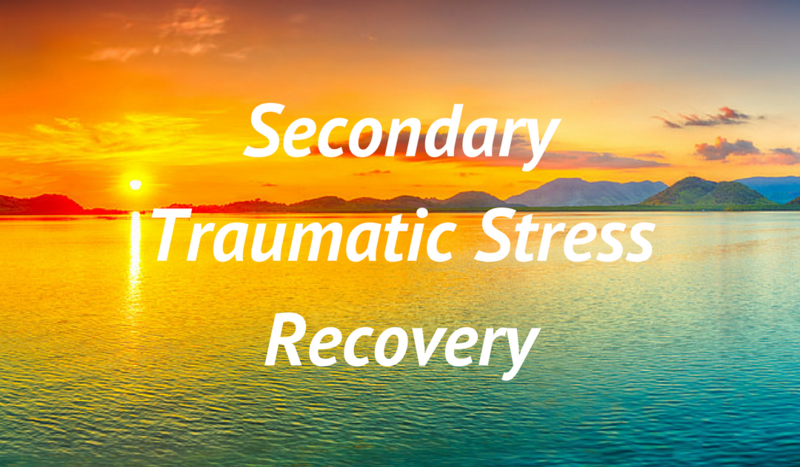 What is Secondary Traumatic Stress, STS? Secondary traumatic stress is the emotional duress that results when an individual witnesses or hears about the firsthand trauma experiences of another. Its symptoms mimic those of post‐traumatic stress disorder (PTSD). Accordingly, individuals affected by secondary stress may find themselves re‐experiencing personal trauma or notice an increase in arousal and avoidance reactions related to the indirect trauma exposure. They may also experience changes in memory and perception; alterations in their sense of self‐efficacy; a depletion of personal resources; and disruption in their perceptions of safety, trust, and independence. 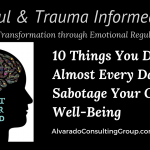 Client care and response to those we serve can be compromised if the officer, worker, therapist or parent is emotionally depleted or cognitively affected by secondary trauma. Some traumatized professionals, believing they can no longer be of service, end up leaving their jobs or the serving field altogether. Several studies have shown that the development of secondary traumatic stress often predicts that the helping professional will eventually leave the field for another type of work. The development of secondary traumatic stress is recognized as a common occupational hazard for police offers, fire fighters and professionals working with traumatized children. Studies show that from 6% to 26% of therapists working with traumatized populations, and up to 50% of public officers and child welfare workers, are at high risk of secondary traumatic stress or the related conditions of PTSD and vicarious trauma. Any professional who works directly with traumatized people or is consistently in a state of heightened arousal and potential threat, and is in a position to hear the recounting of traumatic experiences, is at risk of secondary traumatic stress. 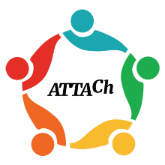 Risk is higher for professionals who carry a heavy caseload of traumatized children; are socially or organizationally isolated; or feel professionally compromised due to inadequate training. Protecting against the development of secondary traumatic stress, and providing recovery opportunities once trauma has occurred, leads to longer duration of professional experience, improved quality and outcomes, less turnover, and higher satisfaction ratings from professionals. A multidimensional approach to prevention and intervention—involving the individual, supervisors, and organizational policy—will yield the most positive outcomes for those affected by secondary traumatic stress. 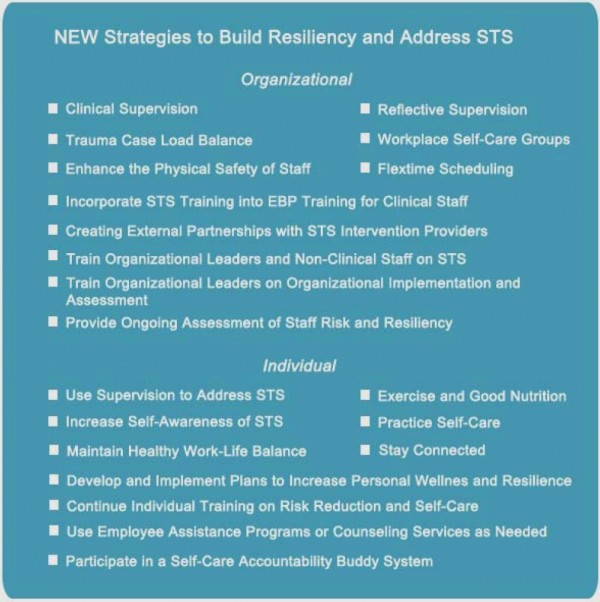 Preventive strategies may include self‐report assessments, participation in self‐care groups in the workplace, caseload balancing, use of flextime scheduling, and use of the self‐care accountability buddy system. Proper rest, nutrition, exercise, and stress reduction activities are also important in preventing secondary traumatic stress. Although research based evidence regarding the effectiveness of interventions in secondary traumatic stress is limited, mindfulness‐based methods are emerging as best practices. In addition, caseload management, training, reflective supervision, and peer supervision or external group processing have been shown to reduce the impact of secondary traumatic stress. 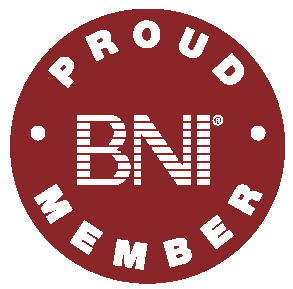 Many organizations make referrals for formal intervention from outside consultants well versed and experienced in providing this type of relief. External group process services may be especially important in cases of death, disasters or community violence where a large number of staff have been affected. Both preventive and interventional strategies for secondary traumatic stress should be implemented as part of an organizational risk‐management policy or task force that recognizes the scope and consequences of the condition. Recognize the impact of secondary trauma on the workforce. Understand that trauma can shape the culture of organizations in the same way that trauma shapes the world view of individuals. Understand that a traumatized organization is less likely to effectively identify and deal with its constituency or mitigate future trauma. Develop the capacity to translate trauma‐related knowledge into meaningful action, policy, and improvements in practices. 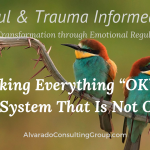 These elements should be integrated into direct services, programs, policies, and procedures, staff development and training, and other activities directed at secondary traumatic stress. For more information about our work, please visit www.alvaradoconsultinggroup.com or reach us at 303‐431‐0604.